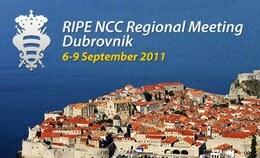 The RIPE NCC RIPE NCC Regional Meeting in Dubrovnik, Croatia, took place at the Valamar Lacroma Dubrovnik Hotel from 6-9 September 2011. This was the first time a RIPE NCC Regional Meeting took place in South East Europe. The RIPE NCC runs Regional Meetings throughout its service region. These regional forums offer network engineers and other technical staff the opportunity to share knowledge and experiences, and identify areas for regional cooperation. The meetings are open for anyone to attend and there is no meeting fee. View webcast archives of the meeting.